While participating in the Foundation’s offshore forum in Korea, Leadership Network member Tim McCready gauged the mood of the country following the impeachment of President Park Geun-hye. In this article, he describes a country divided along ideological and generational lines. We arrived in Seoul for the Asia New Zealand Foundation’s offshore forum at the height of demonstrations over the the impeachment of President Park by the National Assembly. Accused of violating the constitution by helping her long-time friend extort donations from the country’s biggest business empires, Park was subsequently ousted from office in an unprecedented and unanimous ruling by the constitutional court. The president’s ousting brought to the fore simmering tensions that run along ideological and generational lines, at the heart of which is how to deal with North Korea. Peaceful protests are not uncommon in South Korea. The first time I visited South Korea was the one-year anniversary of the Sewol Ferry Disaster. The sinking in April 2014 cost the lives of 304 passengers and crew. This resulted in enormous protests, as South Koreans saw their government having failed to hold high-level officials accountable for the disaster. Prior to Park’s removal, demonstrations and candlelight vigils – representing both sides – took place every Saturday over three months. A few days after we arrived for the forum, the courts approved an arrest warrant for Park, and she was jailed. Demonstrations broke out again. I spoke with a group of protestors living together in a tent within the city square. A man in his 70’s translated and explained to me their perspective of the situation. “We are the right-wing group. We follow democracy. We are protesting because the president was impeached by the left. We are embarrassed that has happened. While this is an extreme view, it does exemplify the generational divide in South Korea. On a simple level, the older generation think that North Korea should be dealt to with pressure and isolation. The left would prefer to have an open dialogue with the North. A lot of this divide stems from South Korean President Park Chung-hee, the father of jailed President Park. He seized power through a military coup in 1961, at a time when South Korea was far less developed economically than the North. By the time he was assassinated in 1979, South Korea had gone through what is referred to as the “Miracle on the Han River” – a period of rapid economic growth following the Korean War. It is because of this that Park, and his daughter, are looked on fondly by older South Koreans, despite his systematic disregard of human rights. There are an estimated 6,700 people from separated families living in South Korea. The tragedy of the situation is most easily seen through those people who are divided from their family, who passionately long for reunification. Now, 70 years on from the division, those with the closest ties to the North are getting very old. The requirement to seek peaceful unification between the two Korea’s is part of the South Korean constitution, yet speaking with younger South Korean’s, they are often agnostic about the prospect. They are already struggling economically, and point to the enormous economic disaster that will become their responsibility if the border were to collapse. During a meeting with a senior banker at a major international bank in Seoul, I asked for his take on North Korea. “I am just a simple banker,” he said, modestly. 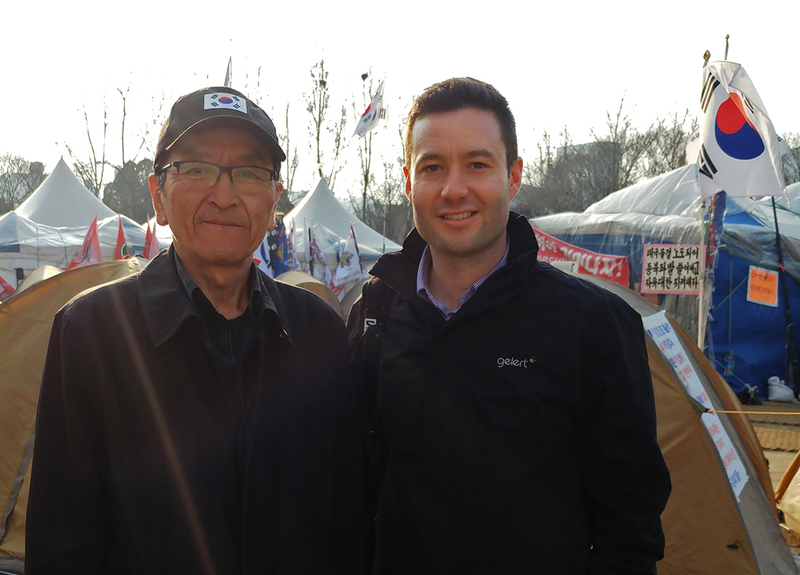 Younger South Korean’s I spoke with shared the banker’s point of view. They don’t worry about the looming threat of nuclear war. Instead, they are getting on with their lives, and their careers – like the rest of us. “We do not spend time worrying about what could happen. That threat has always been there,” he said. That sentiment seems to be something that all generations can agree on.